Did you realize that knowing your body shape can make getting dressed every morning 50% easier? Over the past several months I’ve shared new style trends, “how-to-wear” tips “what-to-wear” advice. But, today, I want to break down what you need to know in order to make getting dressed every day 50% easier. The process is actually more simple than you might think. The key to making the dressing game 50% easier each day is to know your body shape. We all have different body shapes, which is the reason why you might try something on in a dressing room and it doesn’t look quite right. Then, your shopping partner tries it, and you end up rolling your eyes. You are half excited that it looks great on her, and half frustrated that it doesn’t work for you. Since our bodies are different, or clothing will look different on each person. You may be asking yourself, “What is my body shape?” This is a completely normal and commonly asked question. Some of us have a very distinct body shape while others have a combination shape. Our shapes typically change over time, as well. So, whereas you may have had one body shape as an adolescent, it may be different in your 30’s and 40’s and then change as you age each decade. 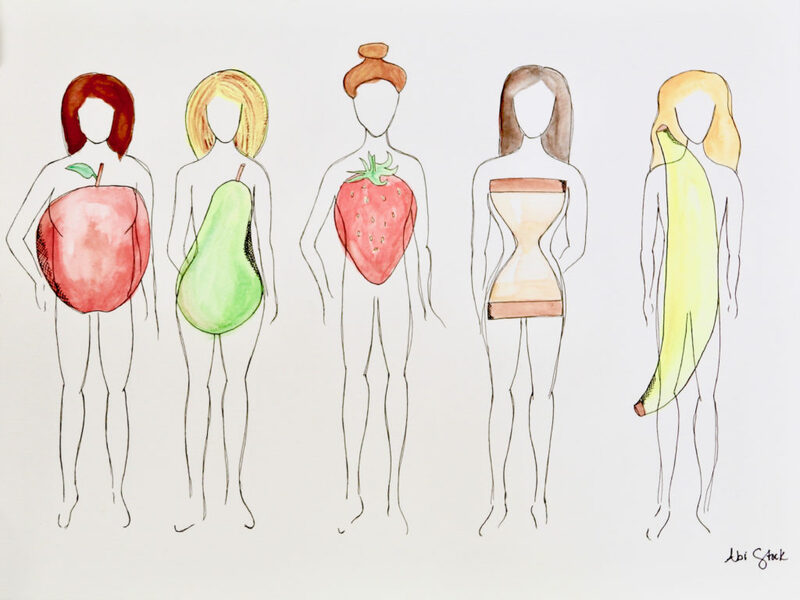 There are 5 main body shapes that are described as geometric shapes or, oddly enough, as fruit. As I describe each body shape, think about which one or ones best apply to you. And, keep in mind, all body shapes should be embraced and viewed in a positive way. If you have a Triangle or Pear body shape, then you have narrow shoulders. a smaller chest, a defined waist, curvy hips and a full rear. With this body shape, you really want to work on drawing the eye to the upper body. This means that you should select clothing items, like tops and necklaces, that draw a focus upward. For the Rectangle or Banana body shape, you have what I call the “Straight Up and Down Silhouette.” If you have this shape, your shoulders are aligned with your hips. You have a small to average bust. Your waist is undefined. And, you have a smaller rear and minimal curves. With this body shape, you want to enhance your waistline and draw the eye upward. Next is the Hourglass shape. And, if you have this body shape your: Hips and shoulders are balanced. You have a full bust or a large chest. Your waist is narrow. And, your thighs are thicker and your bottom is rounded. With the Hourglass body shape, you really want to enhance your waistline. Next is the Oval or Apple body shape. If you have this shape your: Shoulders are broad. You have an average to large chest. Your waist is larger than your chest and hips. And, you have good legs. With the Oval/Apple shape you want to enhance the shoulders and select items that flatter your legs. And, lastly, if you have an Inverted Triangle or Strawberry body shape then you have: Square shoulders; a large chest; little definition in the waist; narrow hips, and great legs. With this shape, you want to enhance your lower half. For a full video of this, please link to: Alexandra Styles. Over the next couple of months, I will be discussing each body shape in more detail and I’ll be sharing the types of clothing that flatter each shape. So, stay tuned.